Our new son-in-law is Welsh! 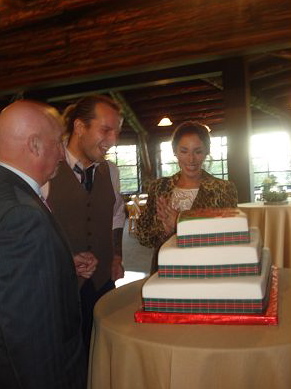 So for the wedding cake, Ashley surprised him with a Welsh flag on top of the cake. I found the Welsh National Tartan ribbon online and had it wrapped around all three layers, which sat angled on top of each other. Maria the baker did a fabulous job with the Welsh flag, which wasn't an easy task. The cake itself was the groom's favorite. White cake with strawberry filling and marzipan frosting! Look how happy it made him, and his father, who came all the way from Wales when they saw it for the first time. The top layer ended up in my refrigerator. No one had the heart to cut into it! Traditionally, it is frozen anyway and eaten by the newlyweds on their one year anniversary. I hope you share all the details. The cake was amazing! What a wonderful idea for the cake! It is amazing! Thanks for sharing these special details. Been thinking of you all weekend. Rest up, mother of the bride! Pretty cake! Looks like a lot of detail went into making this cake. Congratulations! I've been busy keeping new grandbaby after DD2 returned to work. Haven't read the last 4-5 post. I can't wait to see wedding pictures - you will post, right?! The bride's choices are gorgeous, lovely flowers, candles and cake. Congrats to the newlyweds. Wow, most definitely an awesome cake and a wonderful tribute! Congratulations to the Bride and Groom! You have a lot to celebrate this holiday! Oh my gosh, this is so sweet. I just love it! What a great gesture. That is really neat! Congratulations and cannot wait to see the highlights from this special day! Wow! This is such a great cake! I love it. Thank you for sharing all of the great flower, and other wedding details. Cannot wait to see more. wow that is amazing! I'm so loving the flowers as well. We had white hydrangeas at our wedding, cannot go wrong with them!